One of my favorite recipes, ever. My mom made this a lot when I was little. 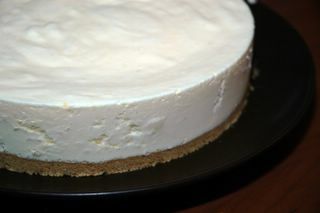 I've posted about a variation on this before - the Frozen Holiday Cheesecake. This is really versatile, you can flavor it with pretty much anything, and you can't go wrong. Per's little sister likes to put chunks of milk chocolate in hers - that's really tasty too. Use a springform pan. Blitz the digestive biscuits in a food processor. Add in the melted butter. Press this firmly into the base of your pan. Cream the cheese, egg yolks and the sugar with the lemon peel. Beat the cream until it forms stiff peaks. Carefully blend with the cheese cream. Beat the egg whites until stiff, and fold those in too. Pour carefully on top of the crust in the pan. Put in the freezer for at least six hours or overnight. Take out about twenty minutes before you want to eat. This keeps well in the freezer. I stumbled across your blog several weeks ago and have been reading it regularly ever since. If the pictures are any indication of the food, everything must be absolutely delicious! I'm always looking for new recipes to expand my collection, and I look forward to reading new recipes you post. When I can spare a few moments, I will try to make some of your recipes (including the chocolate noodles for my husband). Thanks for the enjoyable reading (& photos)! This looks so good. And I love the fact that it doesn't have to be baked. Easy and yum. Thanks! *swoon* This looks so refreshing and a nice treat! Even better that you don't need to heat up the house with the oven! I'm thinking leave the lemon and add the raspberry puree from the next recipe....hmmm..an experiment on the loose. Looks great. I'll definitely be trying this one. Love your site, by the way. I've been stopping by for a few weeks now. Great recipes and photos. I just made your frozen cheesecake and it is delicious. My husband and I love it. Pam - welcome here! I hope you'll stay :) And have fun trying out the recipes! Farmgirl - it's great, and it keeps really well in the freezer too! Glenna - hey, perfect ideas! It's actually very easy to experiment with, you can add lots of things to it! And welcome here! Anonymous - yeay, I'm so glad you tried it! Ann - enjoy it! I hope you'll like it! Har länge följt din fantastiska matblogg och provat på många av de lyckade recepten du lagt ut. Jag tänkte göra din frusna cheesecake med citron på min födelsedag och undrar därför om du vet hur många personen en cheesecake räcker till? Tacksam för svar! Hej Anna! Vad roligt! Den brukar räcka till.. ja, vad ska man säga - 8-10 personer, ungefär? Det blir lätt tio bitar, men ofta vill man ha mer. :) Den håller sig bra i frysen om man råkar göra lite för mycket. This was fantastic. I added a big dollop of coconut cream from a tin and added chopped ginger to the base. Perhaps it was the coconut but it cut straight from frozen.I had a shallow tin so there was lots left over. It made the most fabulous ice cream. Will try lots more recipes now I have found your site. Thanks!